The following article was originally published at www.survivalblog.com. In Part 1 and Part 2 of this series, I reviewed the available information regarding expiration dates of specific medications, primarily antibiotics and antiviral drugs, as tested in the FDA’s Shelf Life Extension Program (SLEP). Although antimicrobial medications are important, what about other common drugs used on a daily basis? If you or someone you know suffers from diabetes, chronic pain, arthritis, asthma, hypertension, heart disease, or other serious condition, will medications be safe and effective beyond their expiration dates? Published data has documented the safety of many medications beyond their expirations dates. The Medical Letter (Vol. 44, Issue 1142, October 28, 2002) states: “84% of 1,122 lots of 96 different drug products stored in military facilities in their unopened original containers would be expected to remain stable for an average of 57 months after their original expiration date.” However, the products tested were primarily antibiotics and other drugs used for emergency purposes. What information is available regarding common medications for other acute conditions, or chronic conditions? Only scattered reports are available. Per the same issue of The Medical Letter, captopril and TheoDur tablets remained chemically and physically stable for 1.5-to-9 years beyond their expiration dates; amantadine and rimantidine remained stable after storage for 25 years; another theophylline preparation retained 90% potency for about 30 years. The Medical Letter concludes, “Many drugs stored under reasonable conditions retain 90% of their potency for at least 5 years after the expiration date on the label, and sometimes much longer.” They also mention that there has only been one reported case of dangerous degradation of expired medication, and that was of a type of tetracycline product that is no longer in human use. [JWR Adds: As previously mentioned in SurvivalBlog, the issue with tetracycline tablets of that vintage was a degradation of the tablet binder, and that binder is no longer in use.] (I do not know if veterinary antibiotics might use the old preparation, however.) Overall then, the concern is not regarding safety, but rather effectiveness. Additional concerns exist regarding liquid preparations, which may be much less stable, and degrade more quickly if frozen or heated. The Medical Letter advises that “Drugs in solution, particularly injectables, that have become cloudy or discolored or show signs of precipitation should not be used.” For oral liquid medications, color changes may be related to the dyes rather than the active drugs, however. Epinephrine in EpiPens was noted to contain less than 90% potency at 10 months after the expiration date. A significant problem with eye drops is microbial contamination once the preservative becomes ineffective. In short, medications for chronic illnesses have not been tested. Nevertheless, it seems reasonable to extrapolate from the known data on drugs that were included in the Shelf Life Extension Program, and conclude that most tablets and capsules would be both safe and effective for several years past their expiration date, when stored in the original packaging at the recommended temperatures. However, there are a few additional questions that deserve attention: extended-release medications, generics, and drugs which require blood testing. Of the medications tested in the SLEP program, few if any were of the extended-release variety. Because Americans like the convenience of once-daily dosing, many drugs have been developed with delayed-release technology. This includes any medicine with the following in the name: XR or XL (extended release), SR (sustained or slow release), CR (controlled release), “slo,” “dur,” or “contin”. The methods by which the medications are slowly released in the stomach or intestine may not be as stable as the active drug itself, and have the potential to be effected by extremes of temperature or humidity. The release may be via a semi-permeable membrane of the entire tablet, or on each individual granule within a capsule, or by a layered tablet designed to dissolve at different pH (acidity) levels. Under adverse conditions, the active drug may be released more quickly or more slowly than intended, yielding unpredictable clinical results. For example, an extended-release blood pressure medication that enters the blood stream too quickly may lower your blood pressure too much or too rapidly. If released too slowly, it may not reduce your blood pressure adequately or at all. The dose of medication in a delayed release narcotic may be lethal if absorbed all at once. Although I could find no specific data regarding stability of delayed-release or extended-release medications, I question whether they would be as stable or reliably absorbed as the regular versions of the drugs. Having your doctor change your medication now to a non-delayed-release preparation is a consideration. Of course, these rapid-release medications often must be taken more than once a day. Examples include Toprol XL, Wellbutrin SR and XL, Biaxin XL, Diltiazem SR and XL, Xanax XR, Effexor XR, and many others. Fortunately, the older, immediate-release versions are usually less expensive. Whereas I believe the quality of most generic medications is excellent, I have, however, encountered some generic drugs that are difficult to swallow, or crumble easily, or stick together, or become discolored. Some of my patients swear by one generic and claim another is ineffective. If possible, investigate the country of origin of your generic prescriptions. In this case, “Made in the USA” is a good sign. Yet another concern lies with medications where blood levels are usually monitored. Of course, at TEOTWAWKI it’s unlikely that blood testing will be performed. Drugs with “narrow therapeutic windows” pose a special concern. These drugs are ineffective at low dose but toxic at higher doses, with a small window between where the drug is therapeutic. Such drugs include digoxin, lithium, and theophylline. When serum drug levels or other biologic indices cannot be measured, dosing must be determined by clinical result and side-effects. Anti-seizure medications, thyroid preparations, and even insulin may fall in this category. To sum it all up, the good news is that most tablets and capsules are very likely safe and quite likely effective for several years beyond the printed expiration date. Using expired medications may do for a decade beyond the end of the world as we know it. About the Author: Cynthia J. Koelker, MD is the author of the book 101 Ways to Save Money on Health Care. The book explains how to treat over 30 common medical conditions economically, and includes dozens of sections on treating yourself. Available for under $10 online, the book offers practical advice on treating: respiratory infections, pink eye, sore throats, nausea, diarrhea, heartburn, urinary infections, allergies, arthritis, acne, hemorrhoids, dermatitis, skin infection, lacerations, lice, carpal tunnel syndrome, warts, mental illness, asthma, COPD, depression, diabetes, enlarged prostate, high blood pressure, high cholesterol, and much more. 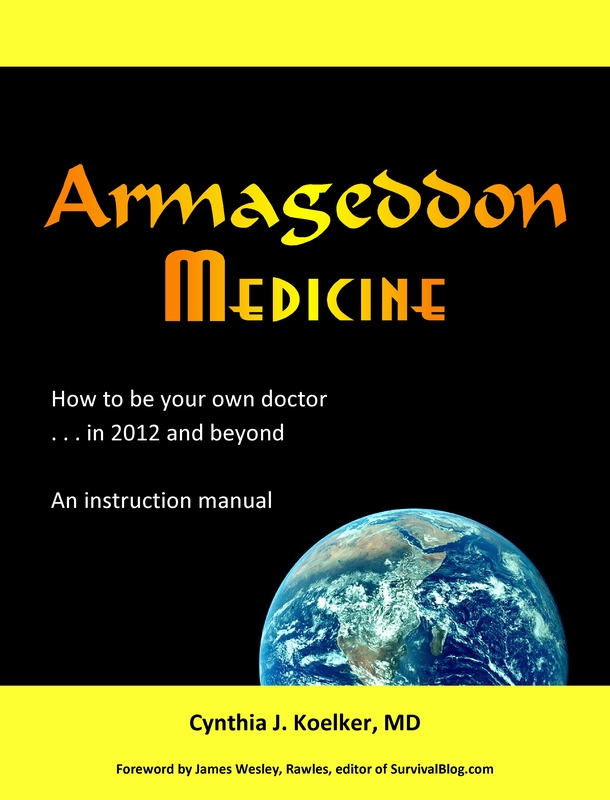 For more articles by Dr. Koelker visit ArmageddonMedicine.net. This entry was posted in Expired medications, Medical archives, Medications, Perennial Favorites, Preparation, Prescription Medications, Shelf life, Stockpiling medical supplies, Stockpiling medications and tagged Clarithromycin, Epinephrine autoinjector, Food and Drug Administration, Shelf Life Extension Program, The Medical Letter on Drugs and Therapeutics. Bookmark the permalink.